We recently saw a trailer for The Circle, a film that I guess in part looked like a dark version of The Social Network. The film will be brought to the screen from writer/director James Ponsoldt. The book follows Mae (Who will be played by Watson) who has landed a highly desired job at The Circle, a new one-stop media platform which has in effect replaced everything from Google to Facebook and is growing bigger all the time. Mae works in the customer satisfaction department and is expected to get near to 100% feedback all the time, which she does rapidly. This is impressive for a newbie, and this pleases Mae, who is not only eager to progress in the company but also wants to justify her best friend Annie’s decision to recommend her for the job. Annie will be played by Gillan in the movie). Mae soon makes friends and learns more about the upcoming projects that the Circle is involved in, including projects to track children anywhere, thus ending all abductions etc; Sale enhancing ideas; ‘SeeChange’, which are cameras the size of lollipops that can be placed elsewhere; a new social media platform that is more specific, that will connect you to more people with likes, right down to specifics, much more so than the obsolete Facebook the Circle brought for its data. How specific occurs early in the book. The Circle has 1000’s of employees, so has its own huge base, with canteens, gyms, cinemas, shops, dorm rooms etc and as well as this, literally clubs of every organisation, and Mae is called up for not attending a presentation on Portugal despite liking it on her Circle account. Mae is encouraged to be more transparent with everything she does, she is in the low numbers of employees participation rank based on Zings (these are like Facebook updates/ tweets etc) which she immediately looks to rectify by attending more of the various events/groups/concerts and lectures etc the Circle puts on. The Circle’s flagship programme is TruYou, a real identity system that will end false identities; multiple user names; complicated password systems and payment systems overnight. Mae suggests that with this, the Circle can even make it compulsory for users to have an account in order to vote! Whilst this may some all intrusive, Mae believes she is making real progress and she is also relieved when her ill father, who with his mother, are in constant worry due to increasing healthcare costs, find it all covered under a family health scheme at the Circle. They believe happy employees make better employees, which she agrees with. Of course, many will object to the monopoly of data that the Circle, including Mae’s ex, Mercer (played by Ellar Coltrane) who does not want all his comings and goings available to all. When she is arrested for the break-in, being a regular she is relieved to find no charges will be made. Upon her return to work, she is called in to meet Bailey (played by Hanks) one of the ‘Three Wise Men’ who created the circle, the other 2 are the CEO Tom Stenton (played by Patton Oswalt) and the not seen and mysterious Ty Gospodinov. Bailey reveals that a Circle user had placed SeeChange cameras at the boating lake, and whilst no arrest was made, all is known of Mae’s breaking and entering. Mae admits she had her feed switched off, and tells Bailey she will come 100% transparent. She will reveal all at the Dream Friday event her plans. Whilst at the event, she reveals her transparency play, and in a ‘one to one’ conversation with bailey her words are made straplines, that SECRETS ARE LIES; CARING IS SHARING AND PRIVACY IS THEFT. It is here, a mysterious stranger that Mae has been trying to form a relationship with, called Kalden (played by Boyega) tries to encourage Mae to stop this happening, before the circle monopolises everything and privacy is no longer possible. It is only after some major events involved at the circle, from the devastating reveals of Annie’s family past; The capture of a criminal who has been on the run in under 10 minutes thanks to SeeShare cameras and when Mae uses the same software to trace Mercer who has vanished. The book suggests things with social media that do not seem highly impossible and it is this that made this such a compelling read. You will agree that some of the circle’s work is worthwhile, from work in science to replicate lives of creatures in the Mariana trench to the tracking of missing persons, you do feel some of it is too intrusive. This really is a great book that is a real page turner. We really hope the book can do it justice, however from the cast list we note Francis, Mae’s first relationship within the circle who is first to alert her of what the Circle can do in ways of damage is not in the film, although he could be renamed. It’s ending in the book does feel a bit rushed so maybe that is something the film can change but we certainly look forward to seeing it! 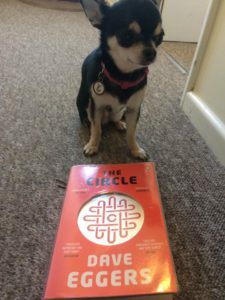 Have you read the Circle? Are you looking forward to seeing the film?